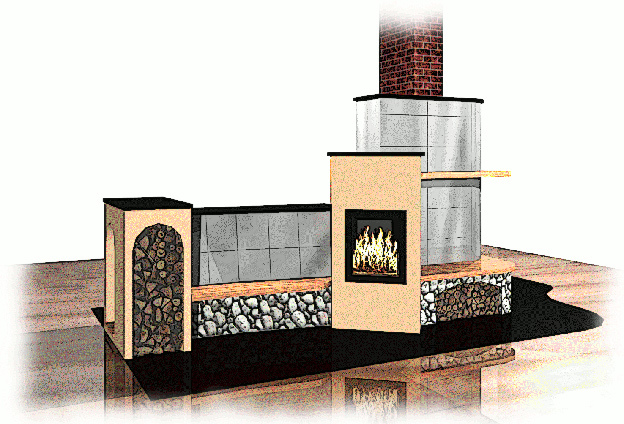 Now that you would like to have a masonry heater for your home, you may be wondering how to proceed. Call or email me to discuss your project. If this is a new home and you can email or otherwise supply me with a set of house plans, that is most helpful. Let me know if you are intending to heat a whole house or a particular area. We may arrange a personal visit to go over the project in greater detail. It will be helpful to know if you like symmetry or asymmetry; tall or short; spread-out or compact. It is also good to know what colors you like the best. I will develop one or more sketches or drawings of the masonry heater. Your feedback will bring the scope, size, shape and appearance of the masonry heater into greater focus. There is usually no charge for initial drawings/sketches/renderings. Once the overall direction of the project is approved by you, I will develop more advanced drawings and a complete proposal for the project. The proposal will be sent to you either electronically or in hard copy (or both) according to your preference. When you are happy with the design and proposal, the terms will be reduced to a written agreement. Once approved by everyone involved, your project will be scheduled and started. Completion dates and times vary with design, materials chosen and my current project schedule. Please do email or call to get the process started.